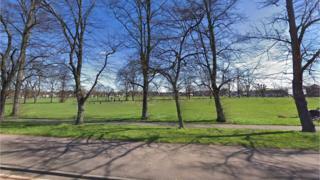 An 11-year-old girl and a 30-year-old woman were injured in a pellet gun shooting in a London park. Two men in their late teens were also hurt in the shooting at Figges Marsh, Mitcham, south-west London, on Sunday. The child was wounded in the leg and the woman was struck in the back. They are known to each other but are not related, police said. Both were taken to hospital with minor injuries and have since been discharged. The teenagers went to a hospital in south London with "non-serious" injuries, the Met Police said. Detectives are trying to trace a large group of men seen in the area before the shooting. All the injuries are thought to have been caused by shotgun pellets fired from a pellet gun. The Met Police activated a Section 60 order in the borough of Merton. It allowed officers to detain anyone for searches until 06:55 GMT on Monday.